In May 2014, work began to convert the former stage set depot of the Staatsoper Unter den Linden in the heart of Berlin into this special academy dedicated to music. Opened in October 2016, the Academy provides West–Eastern Divan Orchestra-based training to highly talented students with a Middle Eastern background. This special ensemble was founded in 1999 by the Argentine-Israeli pianist and conductor Daniel Barenboim and Palestinian-American literary critic Edward W. Said in Weimar. The orchestra is made up of an equal number of young Israeli and Middle Eastern musicians. Their collaboration is testimony to the fact that mutual tolerance and transcendence of borders is a genuine possibility for both Arabs and Israelis. In line with its purpose, the new music academy is also intended to provide a space for fostering mutual understanding and harmony. The solid foundations for this very special academy were provided, amongst others, by Hapke Parkett Objekt GmbH & Co. KG in collaboration with STAUF. The Barenboim-Said Academy offers undergraduate and postgraduate diploma and degree courses in music and related disciplines to around 100 students from Middle Eastern regions affected by conflict. The academy's educational and music director is Daniel Barenboim, who is also the musical director of the Berlin State Opera and of the La Scala in Milan. The listed building has a size of approx. 6,500 square metres and contains a lecture hall with 100 seats, 21 rehearsal rooms, offices and the heart of the academy - the Pierre Boulez concert hall. The concert hall was designed by the US-American architect Frank Gehry, who created the design for this extraordinary project free of charge. The concert hall has been named Pierre Boulez in remembrance of the conductor and composer who died in January 2016, has a total of 600 seats and also hosts public concerts. The interior of the approx. 850-square metre concert hall has a most unusual design in that it comprises of two ellipses that are offset from one another in such a way that the upper tier gives the impression of being freely suspended in the air - effortlessly and beautifully. And it manages to do so while in fact being comprised of 320 tons of concrete. An outstanding feat of engineering. Thanks to which the hall is generally considered the "Rolls Royce of concert halls", as master installer Werner Hapke appreciatively explains. The creation of the former depot's brand-new interior involved a total of 54 different trades, 2200 cubic metres of concrete and approx. 700 tons steel. The Pierre Boulez concert hall's American beech flooring was installed by Hapke Parkett Objekt GmbH & Co. KG from the Westphalian town of Ahlen. The wood floor installers from Ahlen arrived at the Academy in Germany's capital in the summer of 2016. Fitting flooring of this kind requires a special kind of expertise to ensure the quality of the work, precision and expert workmanship. This was especially important in this particular context, where flooring makes an important contribution to the hall's acoustics. The specialists from Ahlen started their work by applying screed to the 'suspended' tier and by polishing the imposing staircase. The subfloor was prepared using STAUF RM, a high-strength deep fill, repair and levelling mortar. Thanks to its fine grain size, this mortar can virtually applied in the most minuscule quantities, which makes it possible to level even the smallest of dents. The next step, fitting the actual flooring, required a high level of concentration and precision. Using STAUF's proven notched trowel no. 4 (TKB B15), the installers applied STAUF SPU 460, which is a non-hazardous, solvent and isocyanate-free flooring adhesive with very low emission levels and actively contributes to a pleasant indoor climate for musicians and the audience alike. STAUF SPU 460 also has a number of other benefits, including that it is easy to apply, cures fast and sets quickly. The flooring, which has been custom-designed by Hapke, was fitted with extra care and, in addition to applying adhesive to the tongue and groove joints, the installers also used STAUF WOOD GLUE L, an adhesive that cures rapidly and turns transparent after just briefly pressing the wood down. Werner Hapke has been using STAUF products for decades with great conviction and success. "I find it really difficult when product ranges become too complex. 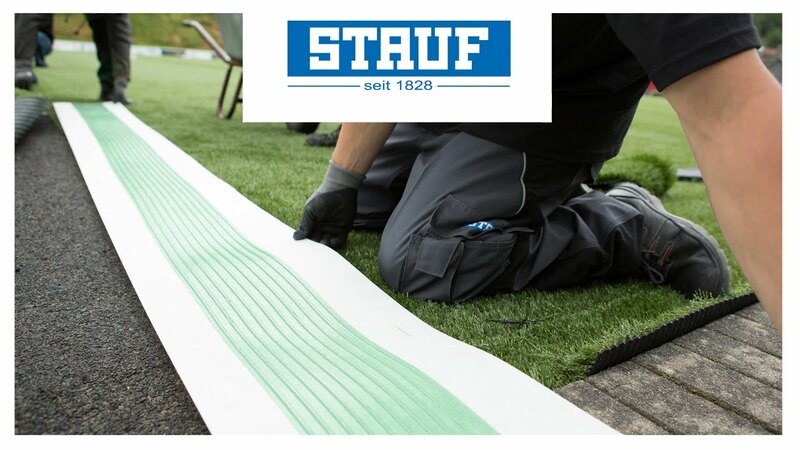 With STAUF, I always know where I'm at – from the primer to the levelling compounds and adhesives", explains the 71-year old. His son Oliver, who is a partner in the company, is also a strong advocate of the reliability of STAUF's products. Both father and son are equally impressed by the academy in Berlin and particularly so by the view from high up down onto the stage "Which is a very special delight!" as they call it.